Photo courtesy of Rufus Food and Spirits Guide (rufusguide.wordpress.com). Thank you, Greg and Katherine! Our blogging friends at Rufus’ Food and Spirits Guide grow their own garlic, and have posted a lot of ways to use it. When I realized that I had neglected to photograph my garlic scapes before pulverizing them, I asked to share a photo from their blog and Katherine graciously consented. 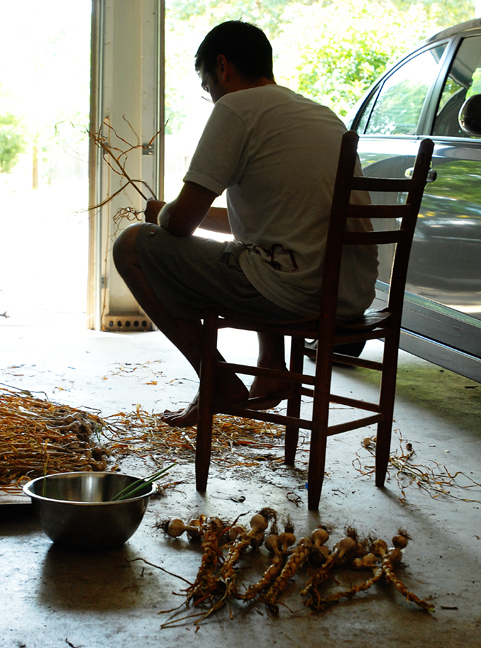 She also offered this photo of barefoot Greg braiding garlic (after he had left the room). It’s such a nice shot! Please be sure to visit Rufus’ Food and Spirits Guide for more garlic scape recipes, and other wonderful things! As a lover of all-things-pesto, it seemed a sure bet for me to use my allotment to make garlic scape pesto. I also had a bunch of fresh cilantro in my CSA box, so there was no reason not to combine the two. This is great stuff – you can add it to about anything that could use some garlic and cilantro. Pasta with pesto is a given, but I’ve also mixed it with mayonnaise as a topping for fish or with gluten-free breadcrumbs to add some pizazz to baked chicken, and tossed it with cooked potatoes for a burst of fresh flavor. There are many possibilities! This recipe made enough pesto to fill 2 14-ounce jars, plus about a 1/4 cup more. It will keep well in the refrigerator for at least 2 weeks, or you can freeze it in smaller portions. It is a nice vibrant green! Blend the garlic scapes with a few glugs of olive oil in the bowl of a food processor. Add the cilantro, lime juice, and cashews, and continue to process, adding additional olive oil as needed to bring the mixture to the desired consistency. Pulse in the Parmesan cheese, and season with salt, to taste. A true musical genius featured today, the legendary Lee “Scratch” Perry. Jamaican reggae producer and inventor of dub! He’s almost as well-known for his personal oddities as his musical works, but the sounds he coaxed out of ramshackle equipment in his studio called “Black Ark” has no equal in reggae music. First up is a collection of his own work, plus some productions of folks such as Bob Marley and The Heptones. The Upsetter Selection: A Lee Perry Jukebox gives you a glimpse into his unique style. 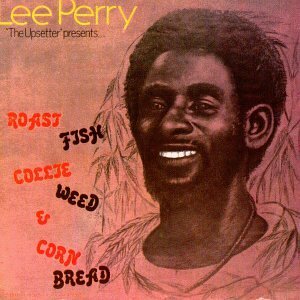 And if that starts you down the “Scratch” path, first stop has to be his masterpiece Roast Fish Collie Weed & Corn Bread . With songs such as “Big Neck Police” and “Yu Squeeze My Panhandle”, how can you go wrong? Yum! Looks super fresh and vibrant! Pesto is a favorite! Fabulous recipe! I am going to see if I can find garlic scapes locally. Can’t say I was even aware of them until now! Thank you! Thanks! The garlic scapes were new to me too, Carrie. From now on, I’ll know when to look out for them. This makes me wish I still had scapes. Thanks for the shout out and the great idea! This looks so good!!! But what is a CSA box????? Thank you – and I guess I should have explained CSAs! CSA stands for community supported agriculture, and is usually offered by local farms. You sign up before the season starts, and every week (or other defined time) you pick up a box of fresh produce from the farm, dropped off at a convenient location. So far, our typical box this spring from Rise N Shine farms includes a bag or two of mixed lettuces, radishes, sugar snaps, or beets, kale or swiss chard, a quart of strawberries…whatever is ready for harvest! I see! I’ve seen it on other posts so I figured it was about time I asked! Do you pay a set fee every week? For this particular CSA, you can pay all upfront, or pay in installments (roughly monthly). Since growing produce is never a sure thing (weather, bugs, bad luck), you have to take a little leap of faith that the crops will come in. You never know what you might get week to week. However, you do know you’re supporting local organic farmers! This entry was posted on June 7, 2013 by She cooks...He cleans in Sauces, Marinades, and Rubs and tagged cashews, cilantro, easy, garlic, garlic scapes, gluten free, grain free, lime, low-carb, nuts, paleo, Parmesan, pesto, primal, recipe, scapes, shoots, stems, topping.